Yes, we know: everyone, including your mom and your dog told you that Iran is a very dangerous place. For sure, people like Mr. Donald and the Western Axis of Pure-breed Clowns (that is, the Western World) have this thing with Iran, that it must be oh such a terrible place you must avoid and forget it even exists. 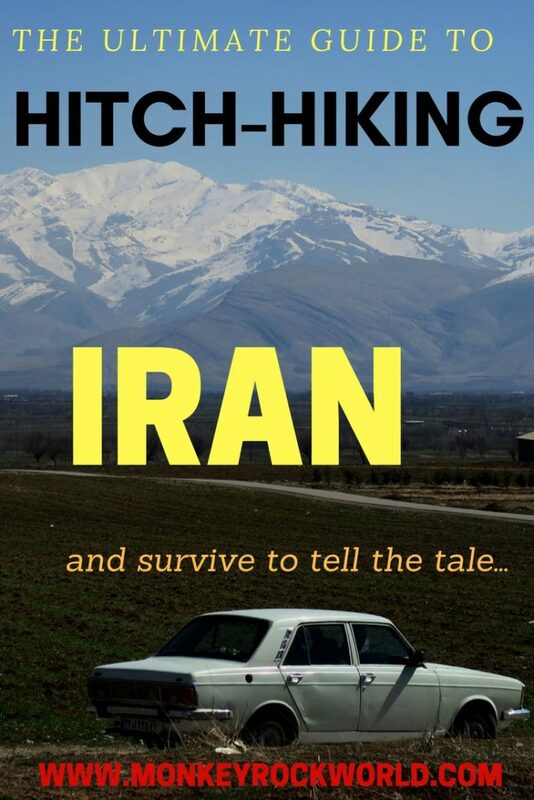 To most, hitchhiking in Iran would be seen as an act of pure irresponsible madness. There have been of course an increasing number of online reports, like this from Lost With Purpose and this by the Broke Backpacker saying, on the contrary, how much the country is not just safe to visit, but pure traveling bliss. And that’s all true: Iranian people, being treated as the scumbag of the Middle East and the World, are just too happy to meet foreigners and talk to them. Most of them have good English skills, and a dire desire to practise it with you. And those who don’t always have ways to be friendly and helpful. Many will want to hold your hand and kiss you goodbye. It just seems unreal but it is true, and truer the more you get off the usual worn and established routes. Believe us, these Kurdish Irani women had to kiss Kit goodbye three times before letting us continue our journey. No leaving the market without taking a couple selfies with these cuties… thank you gals! We have been to Iran twice: the first time back in September 2012, coming from Turkmenistan and crossing the border West of Orumyeh into Turkey. The second in March 2017, when we flew from Kuala Lumpur into Tehran, and explored the Western part of the country — check the list of highlights I wrote for the Rough Guides for some good suggestions. Both times we have been treated gracefully well, showered with great hospitality (even kissed several times before being allowed to get out of a car, as I mentioned) and found the country incredibly safe, hospitable and interesting. It’s no wonder, in fact, that even mainstream travel media has now started to put Iran on every bucket list, like this from Nat Geo, or this guide from the Guardian. Few, regardless, have waxed poetic on the ease and incredible authentic travel opportunities that hitchhiking in Iran can throw at you. 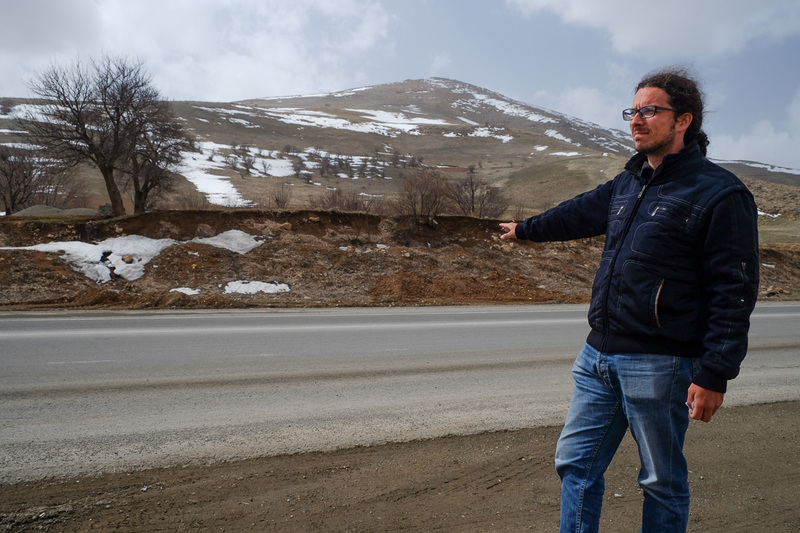 It is quite common for Iranian drivers to ask you to pose for selfies and pictures. 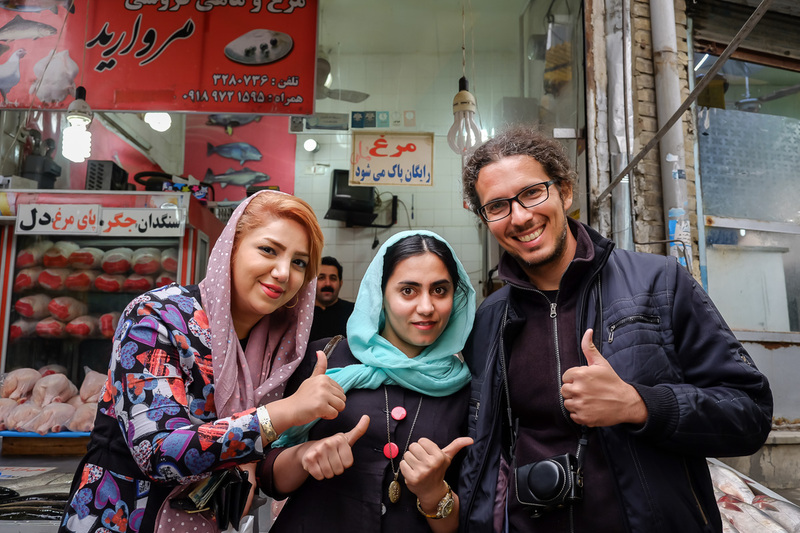 Because, even in Iran, thanks to the above-mentioned recent shower of positive media, a visa on arrival system for most Europeans, and chances to visit for Brits (forget the Americans, for the moment), things are changing. Tourists in the main sites like Isfahan, Tehran, and Shiraz are no longer a rarity. On the contrary, touts are increasing, and so are the prices. For example, back in 2012, you could visit most attractions — including grand Persepolis — for a mere 0.20USD entrance fee, the same price Iranian citizens pay. But today, there’s double-tiering price (something we really really don’t understand), more haggling, and more suspicion towards the foreigner. In some ways, this situation has also reflected in the hitchhiking experience. 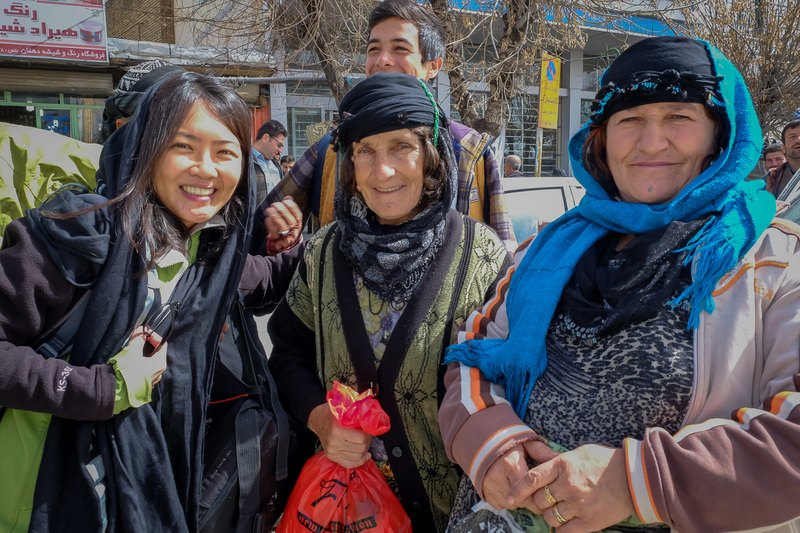 Drivers have started to see more travelers, and hence also have begun thinking of them as a chance to make some more quick Rials (Iran’s currency), rather than genuinely help. 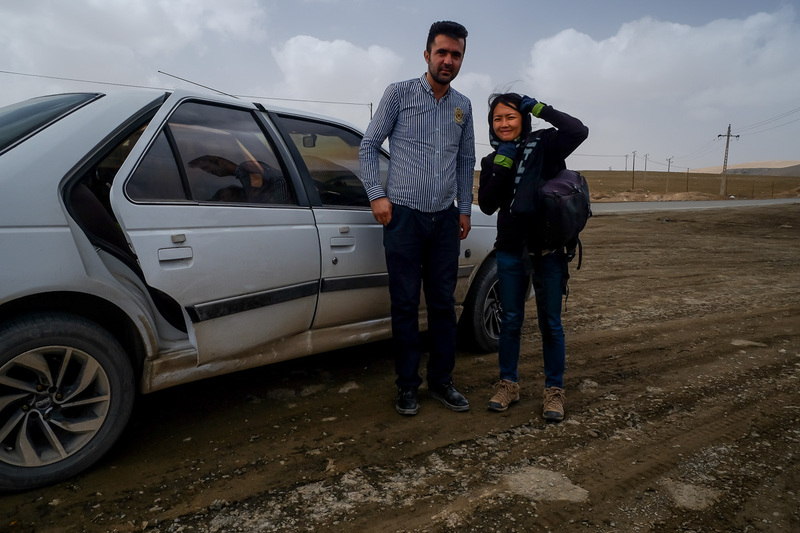 I and Kit have more than 2000km of Iranian roads under our thumbs on each of our two trips to the country, which make for 4k of experience. 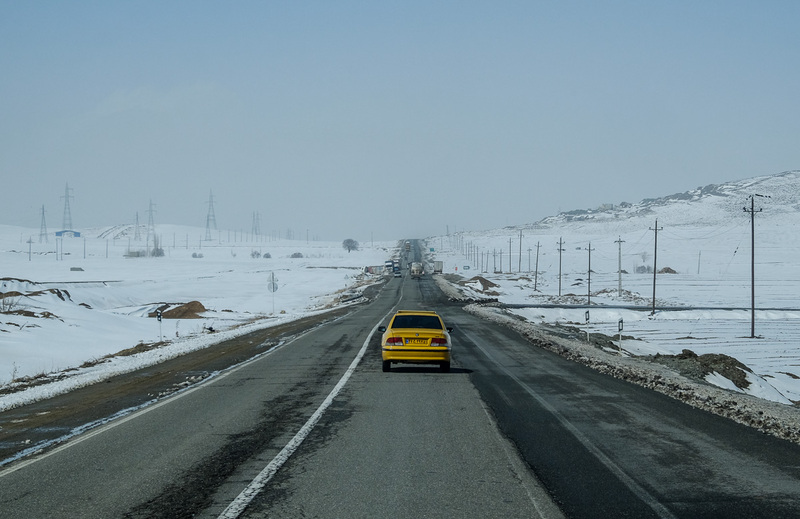 And if you want to really get off the beaten track, and enjoy the experience, you may want to consider these six suggestions while preparing for your next Persian road trip. Which is shaking your hand up and down, like patting an invisible dog, rather than sticking the thumb out. Some young people may understand the latter, but most Iranians will think you are saying you are OK, even if you are standing at the side of a steaming-hot desert at midday. Please pat the dog. Hitchhiking 101: wave your hand up and down, exactly like me! Dear driver, assalamualaikum and pleased to meet you, we are Marco and Kit, husband and wife from Italy and Malaysia. We are travelling with less money and will be very happy to accompany you for a bit, if you are going in our same direction. We can teach you English or just keep you some company. Remember, we cannot pay for this ride, and we are not looking for a taxi. Sorry but we are travelling for long and going far, and all help is appreciated. May Allah bless you for your courtesy. Thank you, assalamualaikum. Wait until they read the full thing and say yes. Repeat, at the end, mahjani, which means “for free”. Then you can get in the car. And you repeat, “I and my wife, here…”. Just don’t leave space for misunderstandings, as you’ll quickly realize there are NO WOMEN traveling like your partner on any Iranian road. 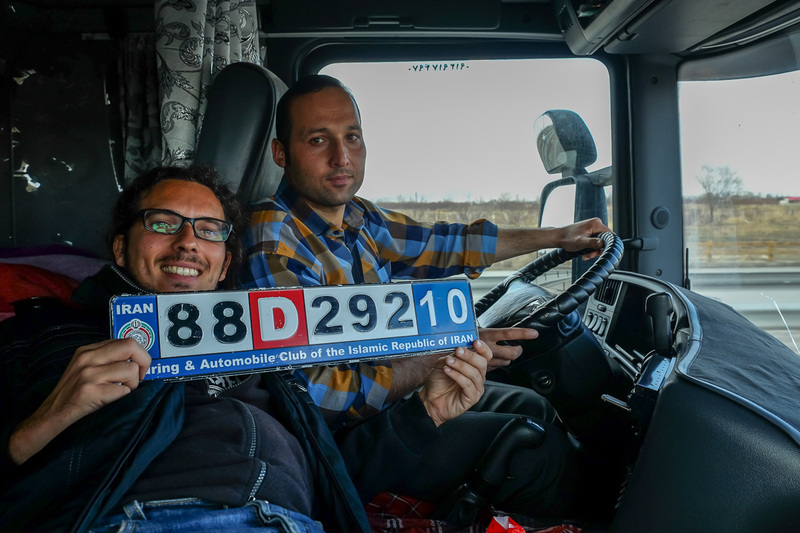 This is debatable between hitchhikers, but wherever we go, and especially in Iran, we never use a signboard to indicate our final destination. Two main reasons: one, we can’t write in Farsi. And two, even if we could, using this method we would reduce the chances of just getting any lift forward, no matter how many kilometers. Since we always carry a tent and sleeping gear when we hitchhike (this cheap yet good one from Quechua is what we currently use), we don’t mind where we end up, and magically, we get more rides in more cars, and we never get stuck anywhere. It’s always preferable to let your girlfriend/wife seat at the back, while the man takes the front seat. Why? Since traveling women are an extremely rare sight in Iran, truck drivers and older rural folks might try to grab some flesh. Send the girl at the back, and try to communicate with the driver. You’ll know in seconds if it’s time to ask him to stop. We never really had any major issues in Iran, but alas… it always pays to be careful. When getting into trucks or small lorries that only have a front row of seats, the man goes in first and sits next to the driver. The woman takes the seat next to the door. Simple advice, yes, but worth pointing out. This Kurdish guy was absolutely gracious and helpful, but I always prefer to put Kit next to the window and take the middle seat next to the driver. In no other country in the world drivers served me hot tea in moving vehicles, but in Iran, it’s the norm. Drivers will pull cups from below their seats, and pour aromatic infuses directly from the kettles they always stash somewhere under their seats. Accepting the courtesy is a great icebreaker, especially when there’s no language in common. To help with this, it’s nice to carry photographs of your hometown, family or travels in your smart-phone, and show them to your drivers. You won’t believe how far we got in “conversation” using this simple trick. Which most often led to invitations to follow our hosts back to their homes and spending the night there with their families, trying real local foods, and seeing how they live. A unique cultural experience you will seldom get if you just browse Isfahan’s Imam Square and stay in a guesthouse. Few people like cops in general, but in Iran, they proved to be very helpful — especially the khaki-dressed military. Show them your letter and smile. They have hailed tourist buses for us, getting us on for free; stopped cars; and on one occasion, even let us camp beside their booth, and handed out blankets to help us spend the night better. The above worked well for us and got us started hitchhiking in Iran, but it’s by no means a complete list of suggestions, nor the definite set of “rules of the game”. Just get inspired by us and then do your thing: we have been there, done that, and lived happily to tell the tale. You can do it, too… and if you do, tell us about it in the comments. Marco Marco Marco, you made my Valentine day by updating your website with Hitchhiking posts from Iran. Much obliged Doctor, and wishing to be back to your country again very soon! Such a beauty!